What is parboiled? Parboiling is a patented process, which changes the nutrients of the rice kernel. After undergoing this process and proper milling, the rice obtains a light yellow or amber color. It cooks up fluffy and separate. Mahatma Gold® is available in select markets. 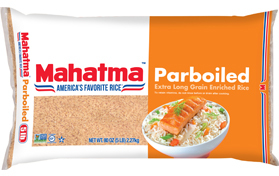 If you are looking for an inexpensive replacement to other brands of parboiled rice, just ask for Mahatma Gold at your local grocer. Available in 2 lb and 5 lb sizes. Bring 2 ¼ cups of water to a boil in a 2 quart heavy saucepan. Add margarine and salt, if desired. Stir in 1 cup rice. Cover, reduce heat and simmer for 25 minutes or until all water is absorbed. 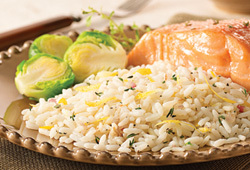 In a 2 quart microwave safe dish combine 2 ¼ cups water and 1 cup rice. Add margarine and salt, if desired. Cover and microwave on HIGH for 5 minutes. Reduce setting to 50% power, microwave for 20 minutes. Let stand for 5 minutes. NOTE: It is recommended that only one cup rice be prepared in the microwave at a time. Microwave ovens vary. Cooking times are approximate. For drier rice, use 1 3/4 cups water. Or, for moister rice, use 2 1/4 cups water.